Date Night returns after a hiatus of a few weeks. Where have we been? On the Bicycle Ride Across Georgia and other trips, which makes blogging very difficult. We figured you wouldn’t be interested in our visit to the Golden Corral in Brunswick last Friday night, but you will be interested in tonight’s date at The Mill in Roswell. In a previous incarnation, The Mill was Relish, which was a really good restaurant that its owner decided to turn into a Mexican place. That was a big mistake and the Mexican place went out, and the space sat empty for months. At the interesection of Mimosa and Marietta Hwy. The Mill opened a few months ago and now we are here on a hot date, which turns out to be not only Date Night #75, but the two-year anniversary of our blog. Happy Anniversary to us! It’s a beautiful night in the ATL, and since the huge storms the night before took all of the humidity out of the air, we decide to sit outside. Date Night co-conspirator caught on camera with beer. 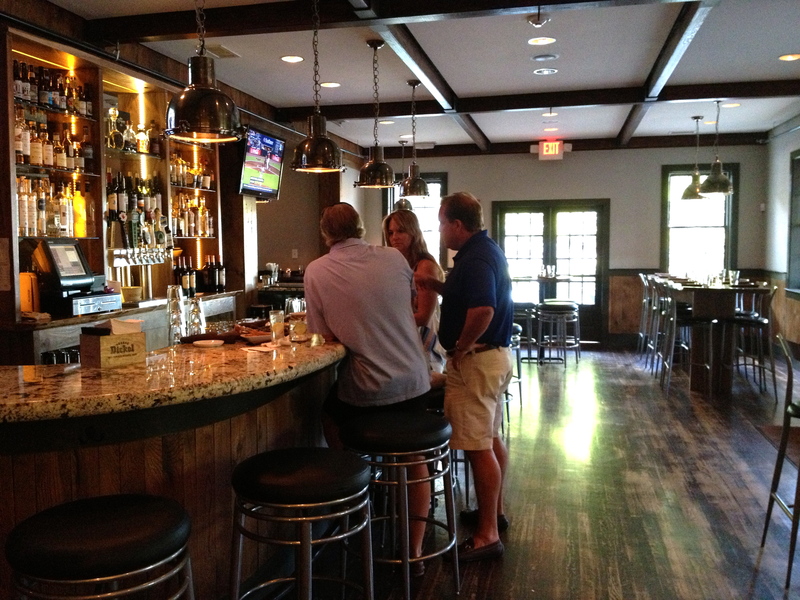 For those of you who like air conditioning, here’s a shot of the bar inside. We didn’t take a picture of the dining room, but it does get noisy in there during peak hours. Belly up to the bar at The Mill. 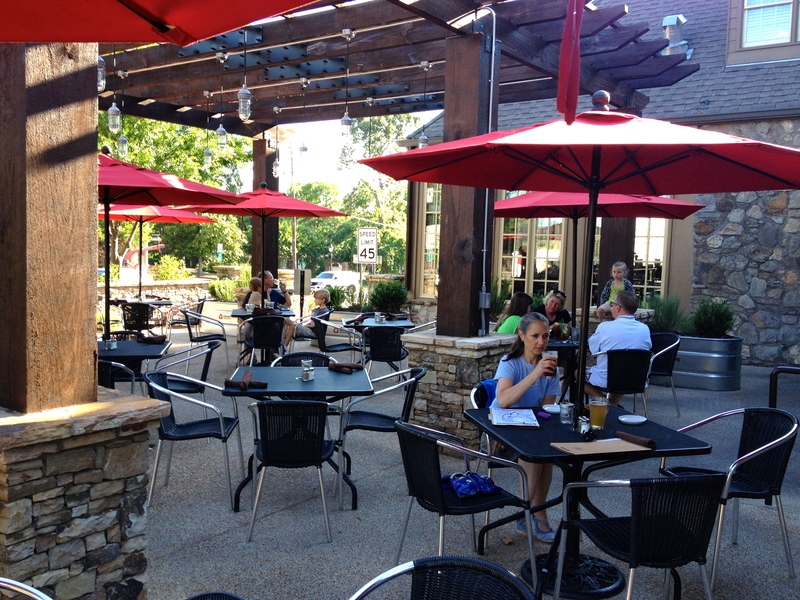 Dining al fresco is a good choice as we are in the shade. We also witness a car accident during dinner and this proves to be a source of entertainment throughout the meal on the patio. Meanwhile, back at the restaurant, we order up some beers. 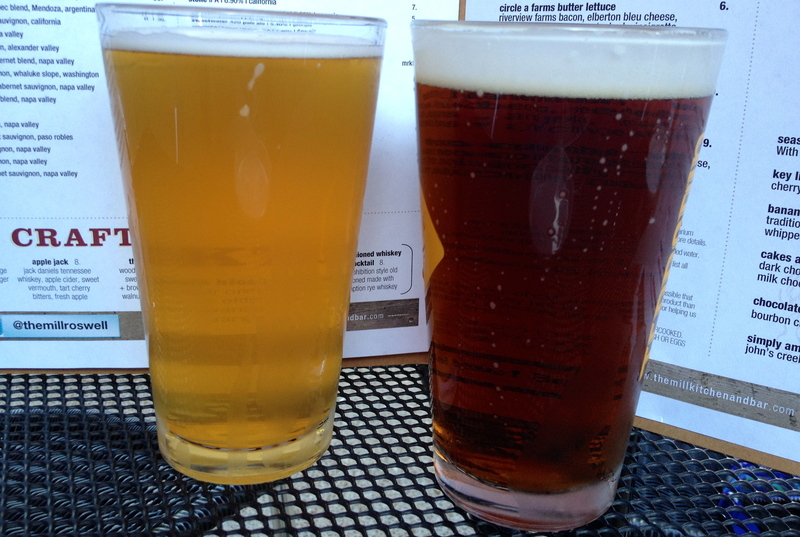 I go for the Hennepin Saison and Eve goes for a Back Forty Truck Stop Honey Brown. The name alone is a good reason to order the Honey Brown, and it’s a good amber brown beer with a nice honey finish. It’s saison season (say that fast a few times), and the Hennepin is very malty without being hoppy, even though it is described by our server Lauren as being hoppy. 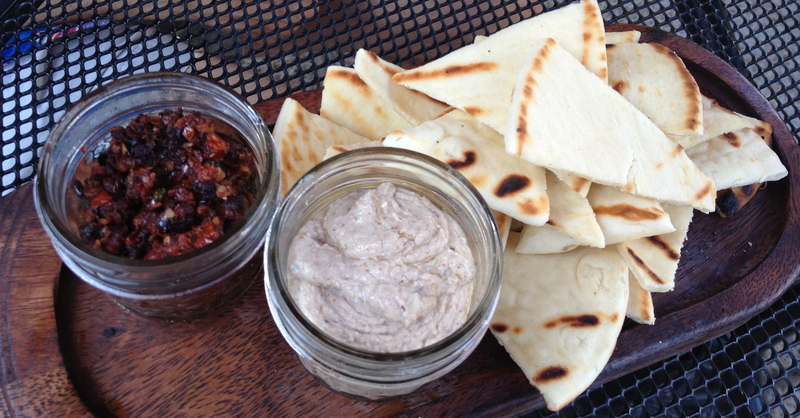 We are hungry and order a plate of black-eyed pea hummus. There’s a hummus among us. It comes with a nice tapenade that’s the star of the platter. The tapenade has pimientos and capers in the mix and we find it quite tasty. We can’t decide whether to split an entree and go for dessert or just get our own entrees. We decide to get our own, which probably take us out of the dessert sweepstakes. Eve goes for the veggie platter. Veggie platter. Good for you. She’s having an excellent meal that’s also good for you. Look at all of the things on that platter. You get two kinds of fingerling potatoes, including purple, as well as pole beans and heirloom tomatoes. And yes, those are Brussels sprouts on the plate as well. 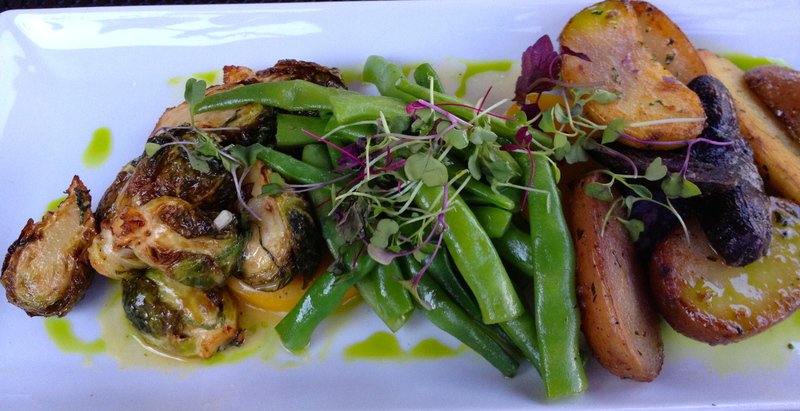 Our longtime readers know about our love affair with the Brussels, and these are excellent sprouts. They should have these as a side dish on the menu. Since one of us is eating healthy, that gives the other a reason to order something fried. 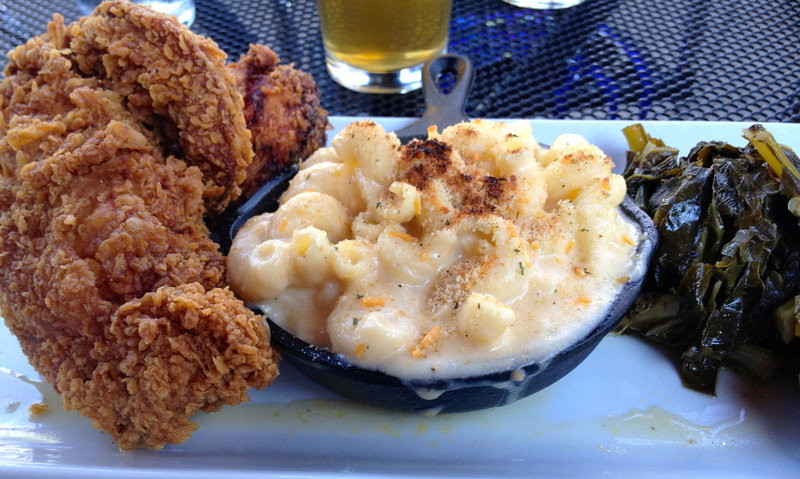 Fried chicken, mac and cheese, and greens. Southern comfort food. I go for the fried chicken with the macaroni and cheese. It comes with collard greens on the side. This is crunchy fried on the outside and moist on the inside. You get a let and a breast and this dish is well worth the guilty calories. There is nothing left on either of our plates when the meal is over. Everyone working at The Mill is friendly and smiling. Server Lauren is a lot of fun and does a great job. The manager comes over to make sure we are enjoying the food and we even get a visit from Chef Ben Castro, who stops by the table as he makes his rounds of the patio. It’s nice to see that, and the place is crowded when we leave, so their efforts must be paying off. 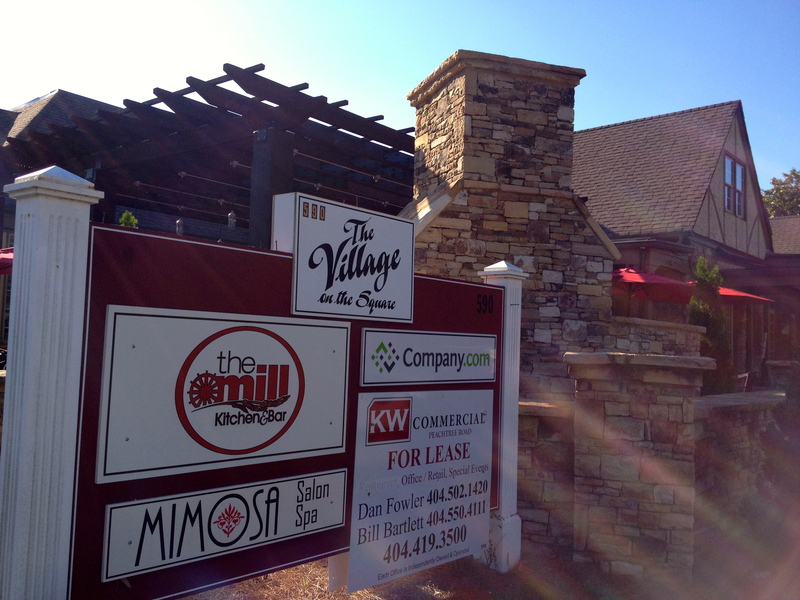 We do skip dessert because we are too full, but don’t skip The Mill if you are in Roswell looking for a place to eat. It’s definitely worth checking out.